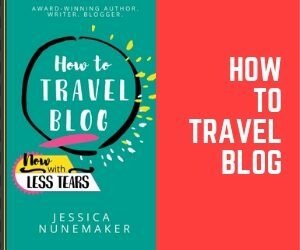 As I finished up this post, I looked for the address. Instead, I stumbled upon awful, terrible, horrible news. Meeting House Antiques in Metamora, Indiana caught fire December 13, 2017, and burned to the ground. No one was injured in the 2 AM(ish) fire. It was not insured. I’m posting this article anyway. 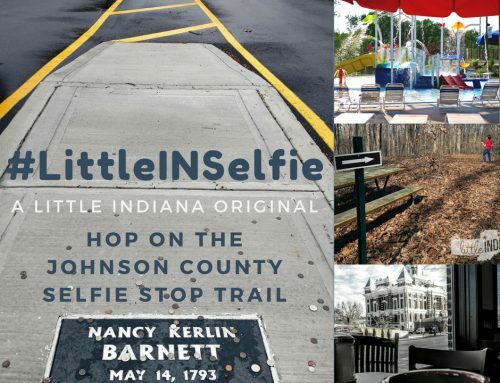 Little Indiana serves as a way to preserve what we once had and fondly remember. Do share your memories in the comments section below. You may contribute to a GoFundMe page someone set up for Meeting House Antiques owner Dave Henninger. We caught our first glimpse of Meeting House Antiques in Metamora, Indiana through the trees. Unfortunately, we were on one side of the state-run canal–and the antique shop was located on the other. I don’t remember where we were in our Metamora wanderings when we first caught a glimpse of Meeting House Antiques through the trees. We could see the shop from across the main drag of the canal. The bike with the banana seat was propped against the sign. Interesting old items were placed around here and there. It creates an appealing exterior you just can’t ignore, especially if you are a treasure hunter. Our oldest, who is somehow twelve-years-old now, is obsessed with treasure hunting. 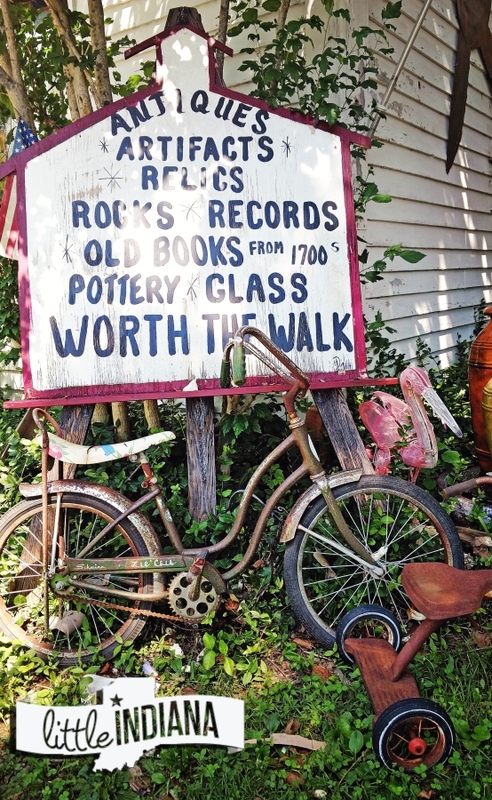 In addition to museums and anything history-related, antique shops rank right up there among his favorite type of destination. It’s the thrill of the hunt. 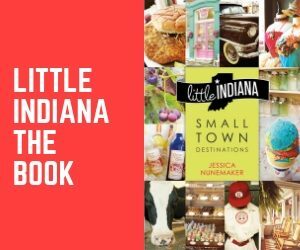 He enjoys searching for the old toys, books, and other items he finds on a good day while browsing through Indiana antique shops. The youngest is interested in much of the same items. He likes the old books, coins, fossils, and rocks. He’s also fond of looking over musical instruments. The big difference between the two of them is that the oldest takes much longer to make a decision. This time, however, there was no delay. Just looking at the place, you could tell it would be great. After seeing the building, we dashed over to the center of town. You can see why our boys were raring to get into Meeting House Antiques in Metamora, Indiana. Now that’s a great exterior! Metamora is unusual. 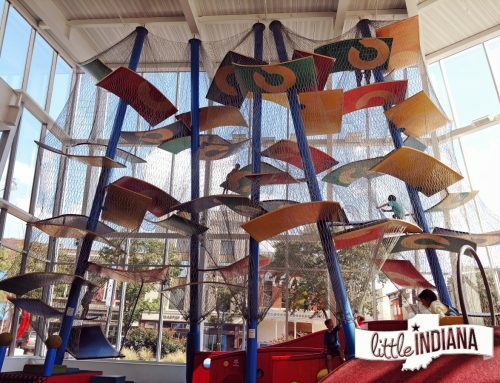 Seriously, this is one unique Indiana town. Like many small Indiana towns, the downtown is laid out in squares. Nothing new there. The main street is flanked by shops and snack shops or restaurants. 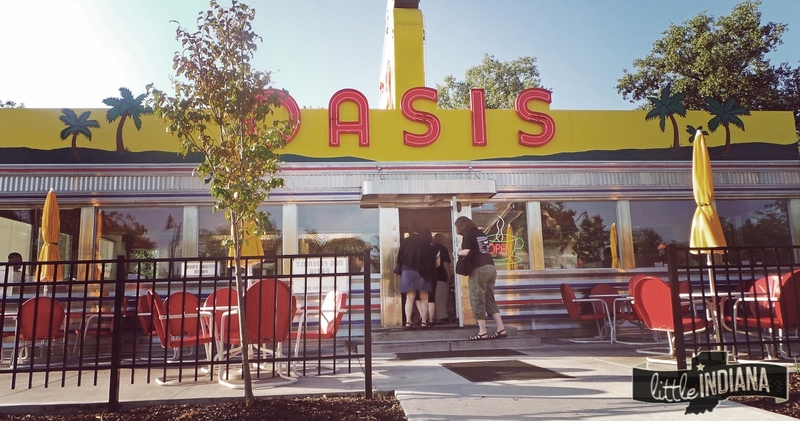 The majority of shops and places to grab a snack are downtown. Not entirely, though, so do branch out. 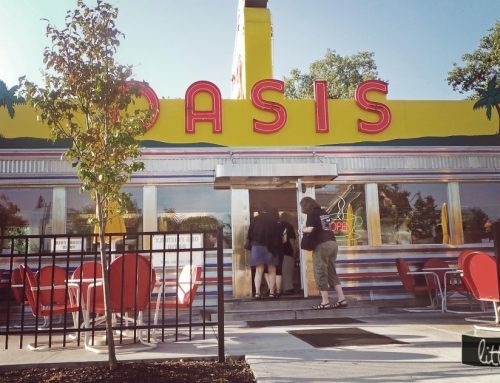 You will find one of our all-time favorite restaurants in the entire state, The Farmhouse, a few blocks off the downtown. 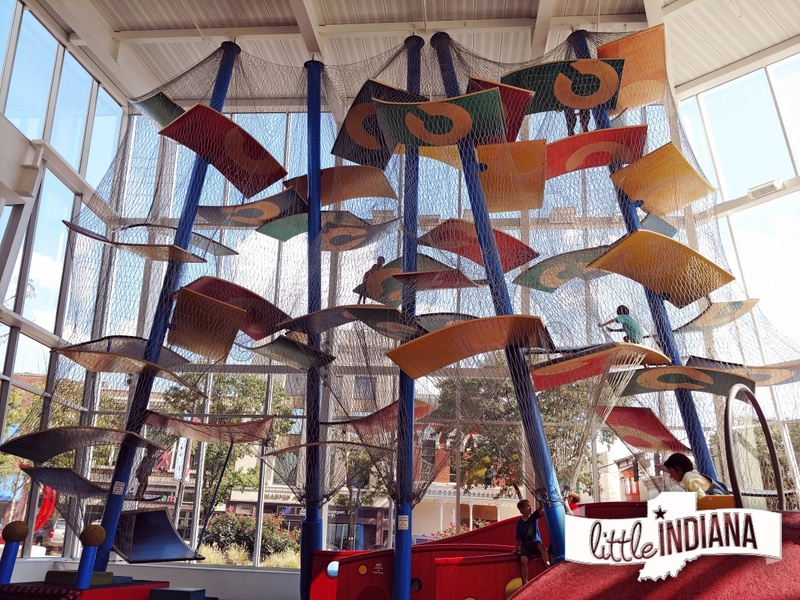 Yes, you will read about it here on Little Indiana soon. Something about Metamora makes the main street a bit different than what you are used to seeing. 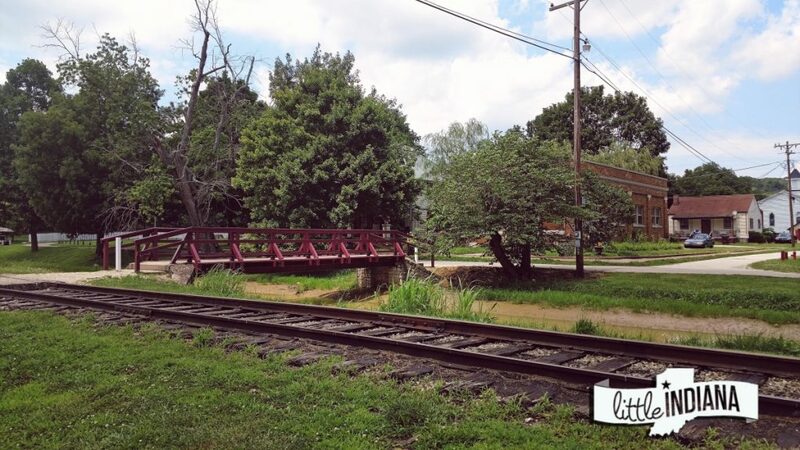 Metamora, Indiana has a canal and train tracks that run right through the center of it. This Metamora, Indiana image may not be the most thrilling, but here you can view how the railroad tracks, canal, and bridge are laid out. It’s unique, don’t you think? The Whitewater Canal divides the downtown into two sections, accessible by bridges at each end. There is plenty of parking. While this isn’t a large downtown, be prepared to do some walking. Kids, especially little kids, will be entertained with the ducks that live along the canal as you make your way along. Yes, you can feed them. The Metamora Canal is a big draw here. 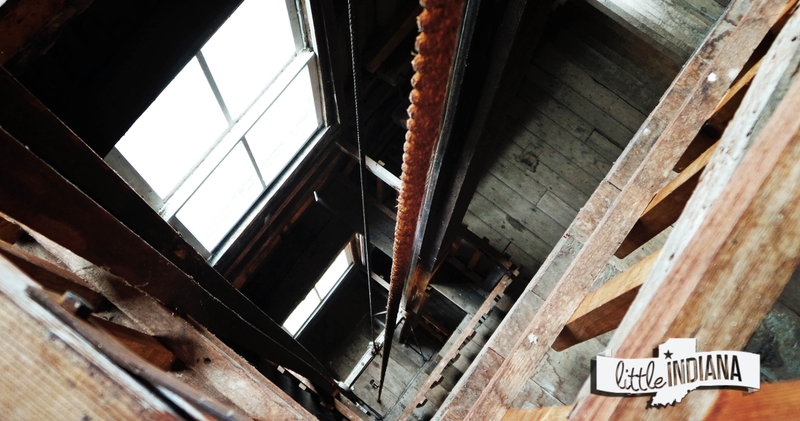 To read more about the importance of canals (seriously, it is interesting), read about Bonneyville Mill. If you are interested in a trip down the canal, you will want to call ahead. During both of our visits, the canal was not working due to repairs. Reach out to the Whitewater Canal State Historic Site at 765.647.6512. Delphi, Indiana, however, springs to mind. It is not a government-operated canal but it does have a canal boat. While the downtown doesn’t center around the Delphi canal, there are some businesses nearby. Perhaps someone local could shed a little light on that one? Delphi historian, Mark A. Smith, a knowledge-keeper of all history-related things, was also perplexed. 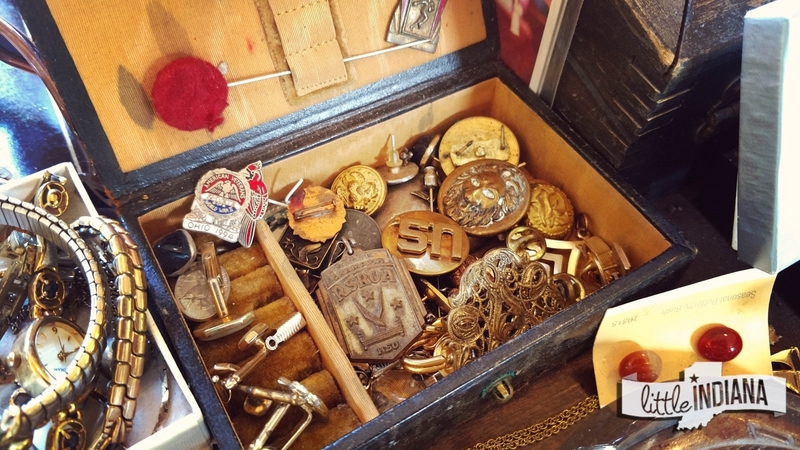 Who can resist poking through a box of vintage items? I can’t. Maybe “Indiana’s Only Operational Downtown Canal” would otherwise be a better option. The best time to visit Metamora, if you want to do a bit of shopping, is May through October during the weekend. That timeline will help ensure that the majority of shops and things will be open for business. Our boys and I, however, have visited during the week twice. He loved the Metamora vibe. They both did. Like small towns everywhere, the shopkeepers and mail delivery person and the rest of the local population all seemed to know each other. I did too. I kept dreaming up small business ideas just to be a part of it all. The one kid we saw that day was chatty and fun. The shopkeepers consistently pointed out other businesses we needed to make sure to visit. The streets are so close there really isn’t much room for speeding, though I’m sure there are some who try. 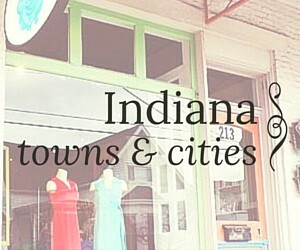 Some say if you have seen one Indiana antique shop, you have seen them all. I’m not sure how those people have it so wrong, but perhaps a bit of a browse inside Meeting House Antiques would help cure them of their antiquing woes. Meeting House Antiques is fun. 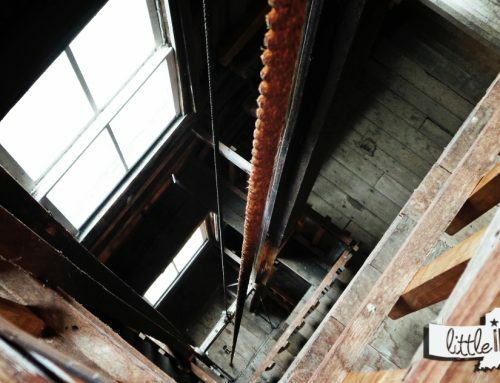 For starters, this antique shop is located inside what was once a church. Meeting House Antiques is located inside what was the Metamora Christian Church for almost 100 years. I am from Northwest Indiana. My Chicago-suburb parents relocated to DeMotte, Indiana when I was going into Kindergarten. I am not used to the age of buildings further south in Indiana. 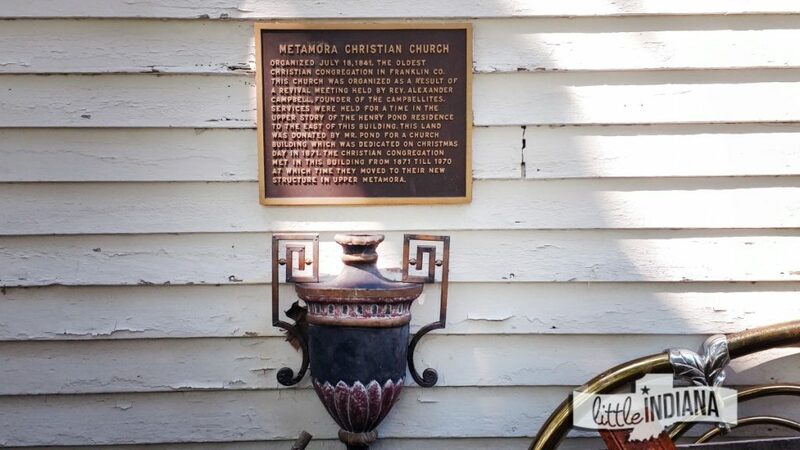 The Metamora Christian Church built and occupied what is now Meeting House Antiques for almost 100 years. Built in 1871, yet organized much earlier, back in 1841, the Metamora Christian Church worshipped here until 1970. They moved to a different building in what they refer to as “Upper Metamora” in the sign above. I wish they had remained in this building until 1971 just to hit that 100 years mark. Meeting House Antiques may not have the pews, but it still has the soaring ceiling and stained glass of the former church. 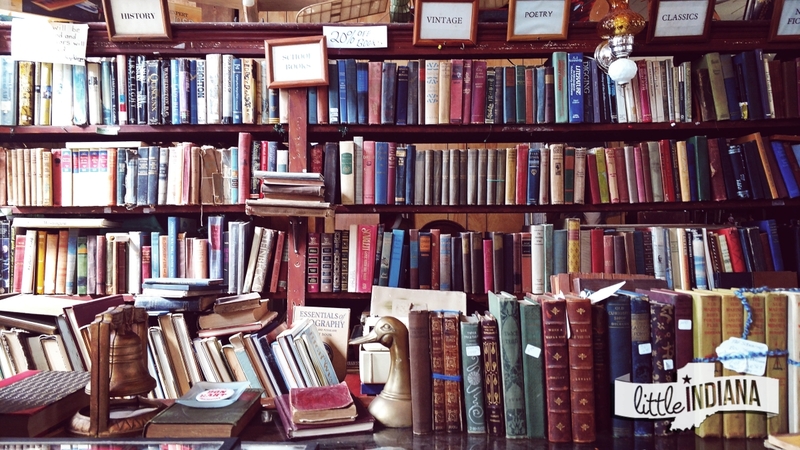 Meeting Hall Antiques has vintage and rare books. I love the way things are arranged. It is the perfect place for an antique shop. 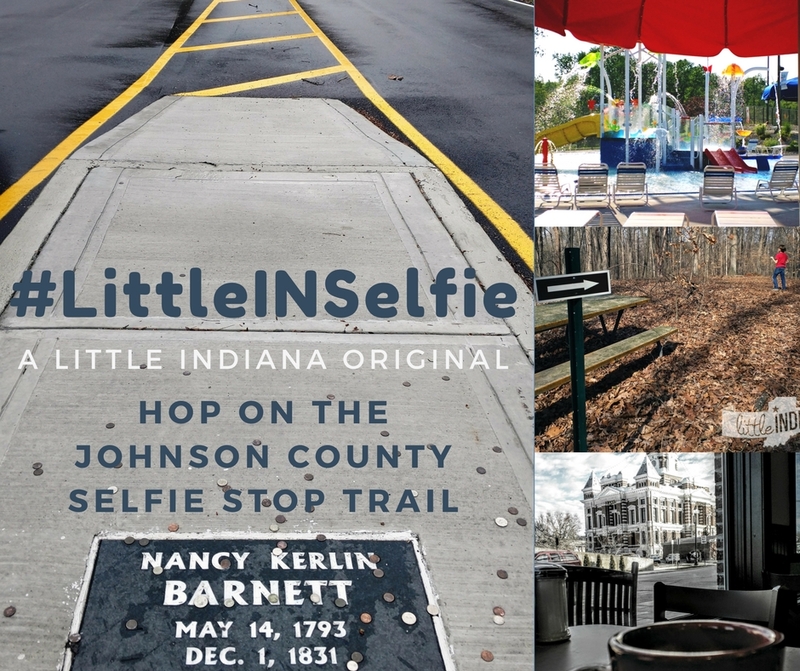 What will you find at this Indiana antique shop? Like many antique shops, there are random items. That only adds to the fun of browsing. 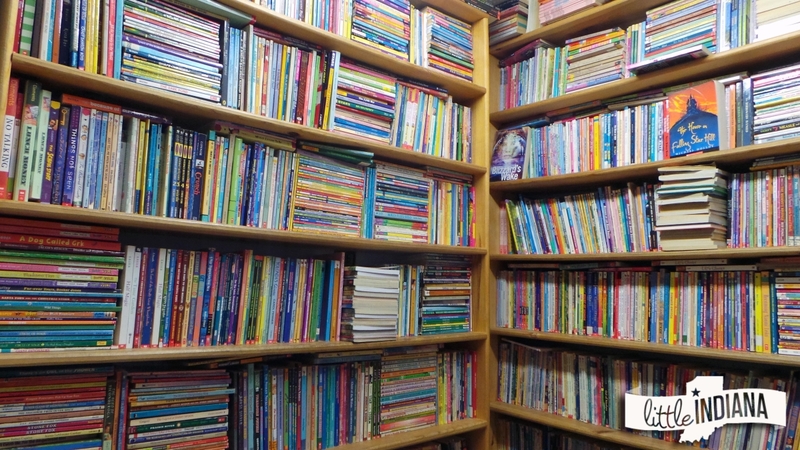 As you can see above, there are excellent old books here. They do carry some rare titles, like the Bible you see below. They are amazing. Take a second to admire them. Like the note reads on the image, it is neat to think about where these books have been. 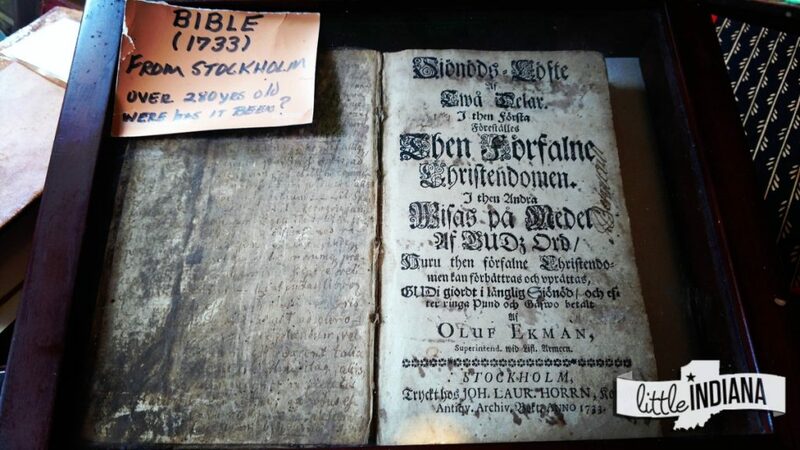 That 1733 Swedish Bible is so old–so where has it been hiding all these years? We also had a very old family Swedish Bible but I am sad to think it may have been ruined a decade or so ago. My mother’s mother was a “Bergstrom.” I loved when my grandma and my aunts would speak Swedish over coffee. Now I only wonder what they were saying that they didn’t want me to know! Rare Swedish Bible at Meeting House Antiques in Metamora, Indiana. There are other old books here too. There are pottery and glassware, and assortments of paintings and old toys in general. If you are a Star Wars fan, you may find some things here to make you happy. I love Star Trek books, nope, I am not even ashamed to admit that, and they had those too. You will need a little time to poke through it all. If you bring kids? You will need even longer. Our boys were fascinated by the fossils. Well, who wouldn’t be? Meeting House Antiques had a fantastic selection. 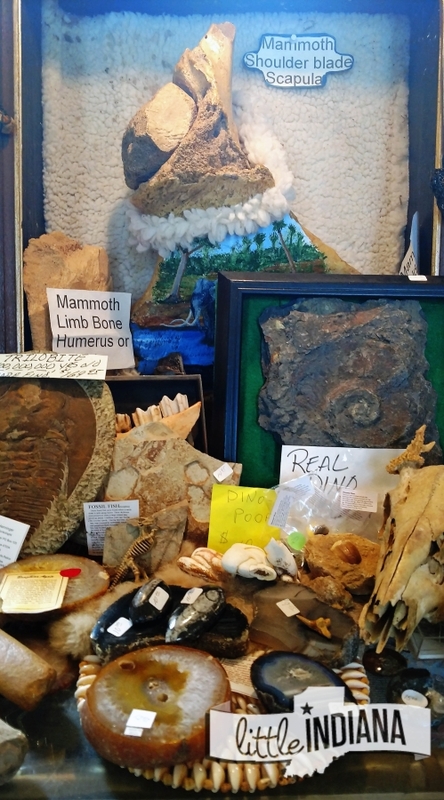 Rare books and fossils abound at Meeting House Antiques in Metamora, Indiana. It captured the attention of our boys. I can almost see a question forming on the lips of our youngest. 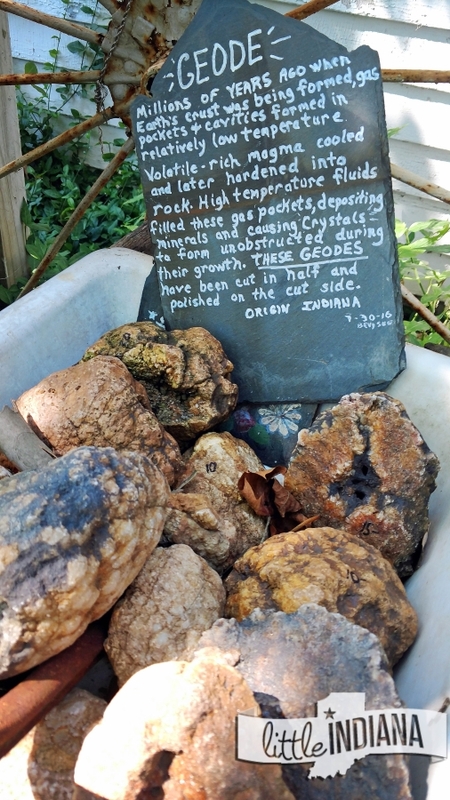 Fossils galore! 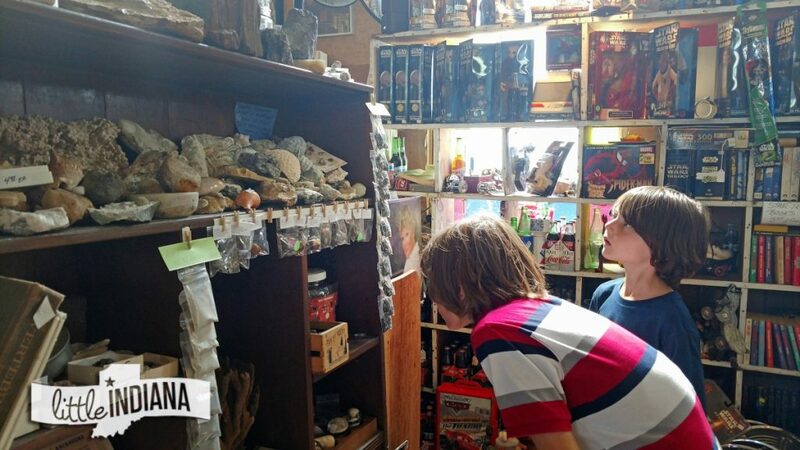 This Metamora antique shop holds a selection of unique items, from old books to pottery to glassware and fossils. 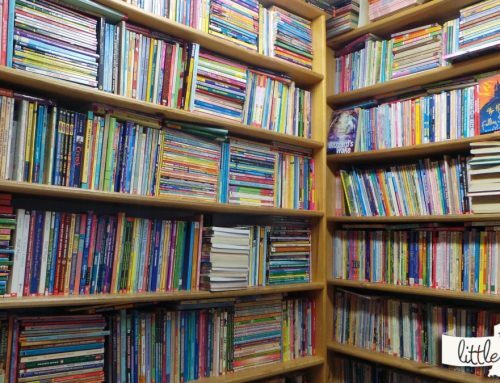 You will love browsing here. The shop owner was fantastic. He made sure to point out some of his most interesting pieces (of which there are more than a few). He took his time and talked about some of them. Our boys couldn’t believe it. They wanted one of everything. The prices were reasonable so they did get to bring home a smaller item of their choice and no, not the Mammoth bone. Our youngest, the electric guitar player, really wanted the cigar box guitar. It’s really cool. The shop owner even played it. But he did find something else that captured his imagination just as well. And that, my friends, is exactly what a good shop should do. 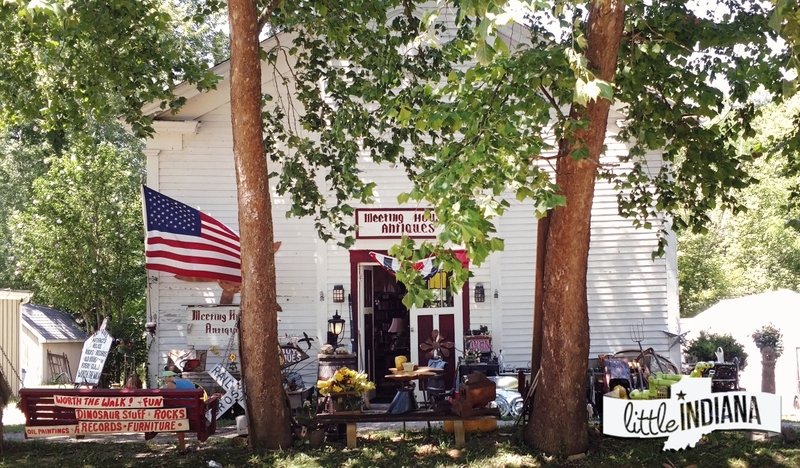 Have you been to Meeting House Antiques in Metamora? What are some of your favorite things? Share your thoughts in the comment section below. THIS BUSINESS HAS BEEN LOST TO FIRE.